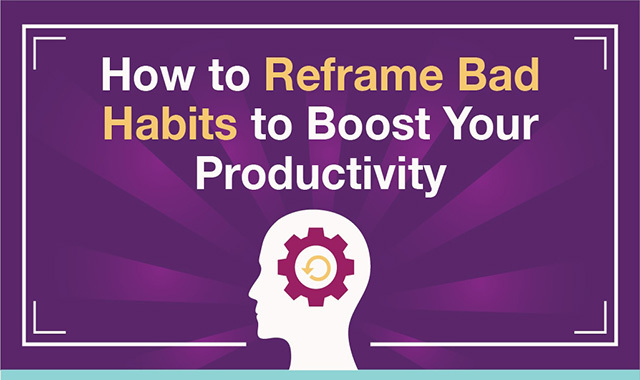 How to reframe bad habits to boost your productivity #infographic ~ Visualistan '+g+"
We all have habits—both good and bad. While good habits tend to be difficult to make, it can be just as hard to break or reframe old habits. In fact, experts say you can’t ever get rid of a bad habit, but you can change it. Every habit can be broken into three components: a cue, a routine, and a reward. By identifying all three, we can create a new routine that offers the same reward. This can be especially helpful at work where a number of bad habits can get in the way of a productive day. For instance, if you tend to respond to emails as they hit your inbox, you’re likely wasting valuable time since these never-ending checks distract you from whatever you were working on. Instead, you can turn off email notifications, close email apps, and create a new routine where you check your email in chunks two or three times a day. Rather than concentrate on breaking your old bad habit, you can focus your attention on cultivating a new, more productive habit. Read on for more habit reframing tips below.